All new homes with private wells for drinking water must have their well water tested. A laboratory certified by the New Jersey Department of Environmental Protection (NJDEP) must sample and analyze the water in accordance with the Somerset County Board of Health requirements. 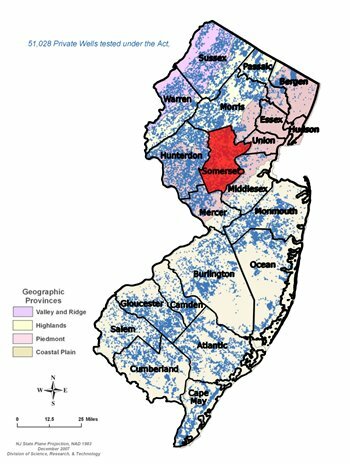 The Somerset County law requires specific testing of the well water for a variety of contaminants and chemical parameters where a Certificate of Occupancy is required. Testing includes a standard PWTA Parameter test (Total Coliform Bacteria, pH, Nitrate, Iron, Manganese, Lead, Arsenic, and a Volatile Organic Scan). ** PWTA Requirements for Chester Boro follow the Morris County Requirements and also require the following testing: Langlier Index, Hardness, Cadmium, Lead (after treatment), Mercury, Selenium, Copper, Chloride, Odor, Total Dissolved Solids, Turbidity, Barium, Chromium, Fluoride, Silver, Zinc, Sodium, Color, & MBAS.